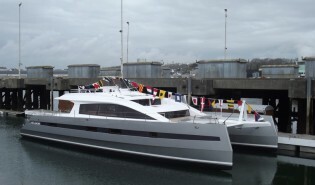 First superyacht Long Island 85′ launched by JFA Yachts – Superyachts News, Luxury Yachts, Charter & Yachts for Sale. This Long Island 85’ catamaran offers a groundbreaking arrangement for this size of boat with the master cabin on fore wet deck with panoramic view and direct access on the fore net. Aft, Salon offers a 360° view, a helm station, a dining area and a bar. Starboard hull is fitted with a guest cabin, an owner office and the master bathroom. Portside hull receives another guest cabin, galley and crew mess and 2 crew cabins. Long Island 85′ yacht is equipped with 2x 380Hp Yanmar engines and 2x 27kW gensets. Masting and sea trials to follow.